Julius Caesar had conquered Gaul in just six years of campaigning (58-53 BC). However, in 52 BC most of the tribes of Gaul rose in a general revolt. Vercingetorix, a chieftain of the Averni, became overall commander of the rebel forces. 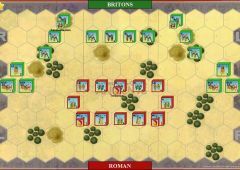 Vercingetorix adopted an effective strategy of defending fortified towns in conjunction with scorchedearth tactics to deny the Romans supplies. In response, Caesar assaulted and captured Avaricum. Next he marched against the Gallic army at Gergovia, Vercingetorix’ hometown. Gergovia was situated on a particularly steep, high mount, making it a difficult position to attack. 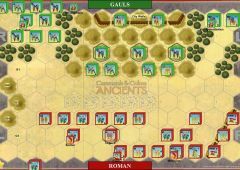 Caesar wanted to bring Vercingetorix into an open battle and stop the Gallic raids, so he set up a large camp for his six legions and built a small camp near the terraced approach to Gergovia. 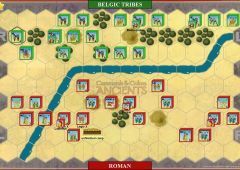 After sending a small force to make a feint away from the town, drawing off many of Vercingetorix’ troops, Caesar ordered his legions and allied troops to climb the hill and attack the enemy camps in front of the city. 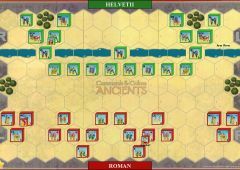 The Romans overcame the stone wall (represented by broken ground terrain hexes) at the base of the hill and moved forward to capture the enemy camps. 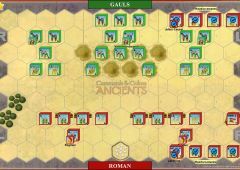 The Gallic reinforcements hurried to the scene and drove the Roman troops back in fierce fighting. 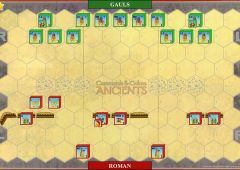 The barbarian advance was only checked by the 10th Legion that was held in reserve. The Romans reported the loss of 46 centurions and 700 troops of all nationalities killed, and another 6,000 wounded. Gergovia was the only major battle that Caesar lost during his conquest of Gaul. 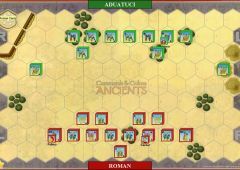 The following day, Caesar attempted to offer battle again but could not induce Vercingetorix to descend from his hilltop position. 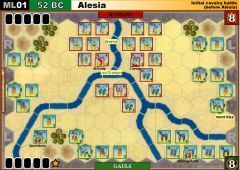 Having failed to achieve his objective, Caesar withdrew. 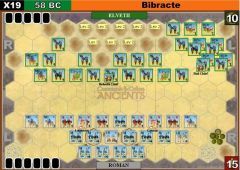 • The four Gallic reinforcement units and leader may be ordered to enter the battle by playing any leadership card. 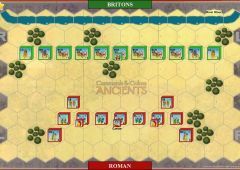 When ordered, set the units on any of the 5 hexes indicated on the Gallic right with Vercingetorix attached to one unit. 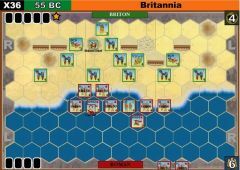 These units may not move further on this turn but may battle. 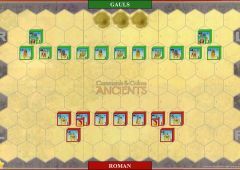 • Then prior to the next Roman player’s turn, the Roman player must place his one reinforcing unit on any baseline hex in his left section. 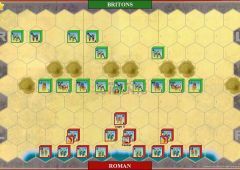 The unit now becomes part of the on-map Roman army, and may be ordered to move or battle. • The Julius Caesar Rule and the Julian Legions rule are in effect. • There are three Gallic camp hexes. 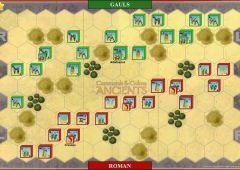 When a Roman unit occupies an enemy camp hex at the start of his turn, remove the camp terrain tile hex. A Victory Banner is not gained for the first camp removed but one Victory Banner is collected for the second or third enemy camp hex removed. Once such a Victory banner is gained, it cannot be lost. 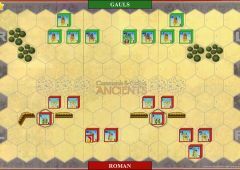 • If a Roman unit occupies a city wall hex, collect a Victory Banner. If the unit moves off or is eliminated, the banner is lost. 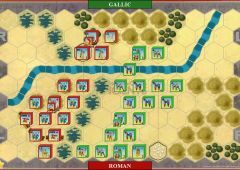 • When a Gallic unit occupies an enemy camp hex at the start of the turn, remove the camp terrain tile hex and collect a Victory Banner that cannot be lost. 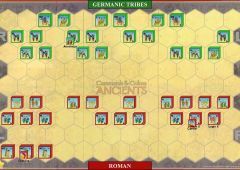 If a Gallic unit occupies a Roman large camp rampart hex, collect a Victory Banner. If the unit moves off or is eliminated, the banner is lost. • The Gallic camp hexes and Gergovia city wall hexes (represented by rampart hexes) are considered to be on a hill. • Gergovia City has scalable walls. Scalable walls terrain rule is in effect. • The hill hexes adjacent to forest hexes are too steep to climb and are considered impassable terrain for units in adjacent forest hexes. 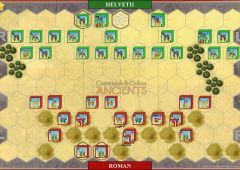 Units on hill hexes adjacent to forest hexes may, however, move or retreat down from a hill hex onto a forest hex. A unit on a hill hex may not close combat against an enemy unit on a forest hex or visa versa. I understand that a Victory Banner is not awarded for capturing the first Barbarian camp, but not sure whether you get 2 medals for the second and third. The rule says "the second or third enemy camp hex removed" but why would you wait until the third camp to give yourself a banner unless it gives a banner for itself? Surely in reality it is one banner only, to be gained after capturing the second camp? I played this twice against Pete the other night. 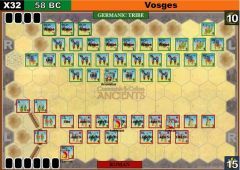 Won it both times, once as the Romans and the other as the Gauls. This one is tougher than it looks. I think luck played a part in my first win, as the Romans. I didn't really have a plan other than to refuse the left so as not to be hurt by his reinforcements, and storm the centre. A good mix of cards allowed me to do this. Pete thought it might be good to come off the hill and attack me while I was in the broken ground. This was not such a good idea. 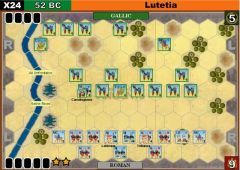 He could not present a solid line, so I could move some units forward to the open ground where I had an advantage, particularly with Caesar supporting them. I got onto the hill, and Pete, desperate to distract me, threw in his reinforcements. 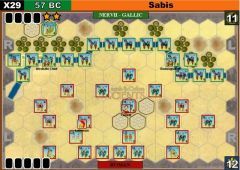 We traded blows on the flank, but I still pushed steadily forward in the centre, causing losses and capturing my second camp to score a win. As the Gauls I felt I had a better plan. 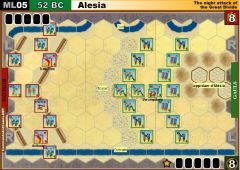 I was going to hold the hill with a solid line, bringing forward my archers and warriors, and fire missiles until he attacked the hill. This worked spectacularly well, with me killing three block of one of his heavy infantry even before it could close to me. 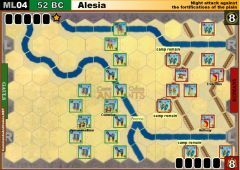 When he did close on the hill he was already weakened, and with my having three dice fighting down to his two dice (except the heavies with Caesar, 3 dice) I had the advantage. In fact Caesar paid the ultimate price of an adventurer, going down with a Gallic spear in his midriff! 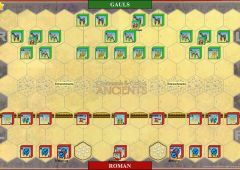 I think this one is tough for the Romans if the Gaul player is patient. Let the Romans come to you, using as much missile fire as possible. It is hard to climb those hills against strong opposition. The heavy bolt throwers played next to no part in either playing. FAQs present for this scenario. CLICK HERE to read.